Gentherm is the leading global thermal technology company for designing,developing and manufacturing heating and cooling mechanisms. Gentherm first reached out to Media Genesis in 2004 to create an updated and enhanced website. Since then, Media Genesis has worked with Gentherm on many different brand, strategy, and web development campaigns. More recently, Gentherm came to Media Genesis to develop a logo that would best represent its 8 core values while maintaining a strong connection to its brand and heritage. The intent for the new logo was to display and use it within all types of spaces (i.e. warehouses and offices) throughout all of their branches. The process started with looking at the 12 countries Gentherm operates within and translating each core value into that language. Some of the languages included: German, Spanish, and Chinese. This was to ensure the new logo could be easily communicated throughout all of the Gentherm divisions. Taking it a step further, Media Genesis evaluated the definitions and meanings of each value to generate a framework based on the hypothesis that each value had a partner. 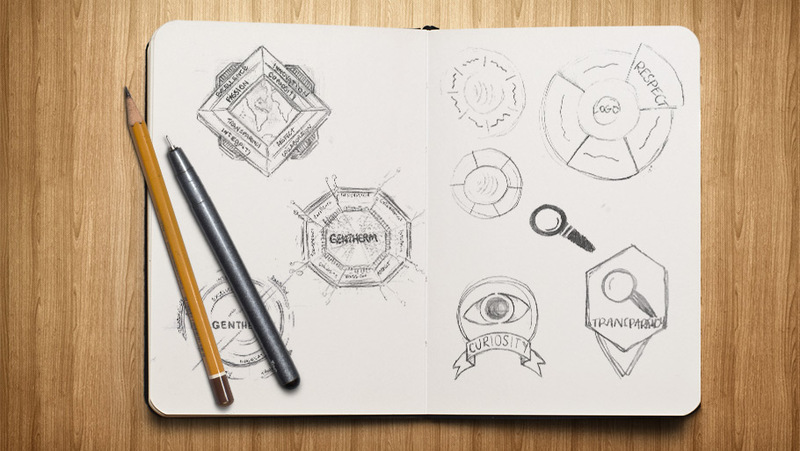 Once there was a good understanding of the values, designers researched and sketched out various options to explore the different concepts that could best work for the logo. In the end, Gentherm went with a simple diamond-shaped design that encompassed the main Gentherm logo, while showing the pairing of the values.